Yet another new Khukri and probably the world first Kukri ever made like this by Khukuriblades.com (Khukuri House Thamel). We call this Kukri the “Kukri Apache”. Yet another new Khukri and probably the world first Kukri ever made like this by Khukuriblades.com (Khukuri House Thamel). We call this Kukri the “Kukri Apache”. Khukuri House Thamel in its 14 years of business has always been making kukris for the Army and for the tourists traveling in this part of the world. And now with our gathered experience and knowledge Khukuri House Thamel would like to design a Kukri that would suit the needs of the world famous tribe and warrior the “Apache”. As we know the Apache never had Kukris with them. They had knives, axes, arrows and may be more. They were/are brave warriors just as Gurkha warriors with with their sharp blades as weapon. They too have put themselves into the history books as the greatest warriors of all time. Khukuri House Thamel would like to pay tribute and salute these famous warriors by designing a Kukri that would suit their needs as a weapon and as a tool. Kukri being a multi purpose blade will surely find a special place in their weapon gallery. 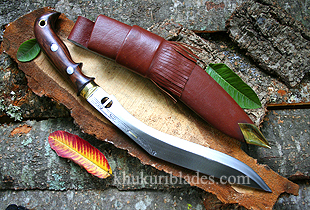 "Kukri Apache" by Khukuriblades.com has been designed very slim and light. Considering they already own axes and knives for chopping, hacking and cutting this kukri has been made with the comination of both. Thus making this kukri as a knife and as an axe. This kukri has rosewood handle, flat tang blade with two rivets for sturdier handle. A hole through the handle can be seen for a leather strap to go in so one can tie around your hand and not loose the kukri in battle or around ones waist for firm placement . Any Apache seeing this "Kukri Apache" would surely love to get his hand on it and go back to time, put on his traditional warrior costume, paint his face, put on his feather crown, arm up with axes and knives, and get on his black Stallone horse and this kukri Apache on his belt and head for battle.